This is a part of our Whirlwind Tour food series, in which we taste through a town’s culinary scene. Stillwater has a reputation for its sense of history (founded 165 years ago, it’s among the state’s oldest towns) and its downtown embraces the past with everything from its motto (“The Birthplace of Minnesota”) to historic walking tours. That said: If you haven’t dined in Stillwater recently, you haven’t really dined there at all. 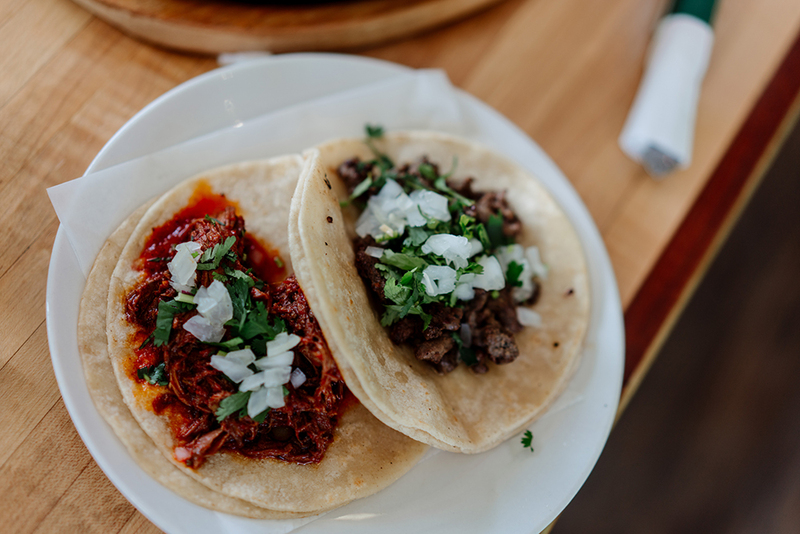 Turnover in this popular tourist stop on the St. Croix River has been ferocious, and there’s ample opportunity for visitors to dine on everything from white tablecloth restaurant fare to tacos at an authentic taqueria. 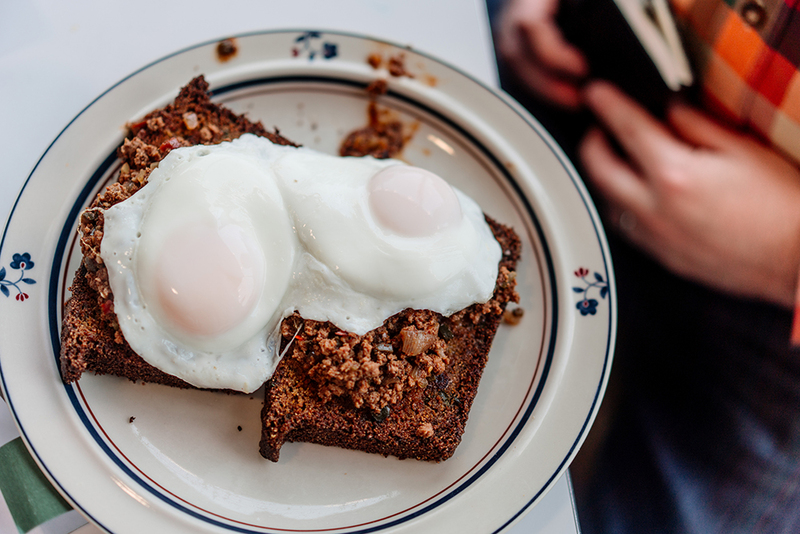 While many of the higher caliber restaurants are clustered on Main Street, trips to other parts of town will be rewarded with tasty breakfasts, charming cafes, and food with global roots. 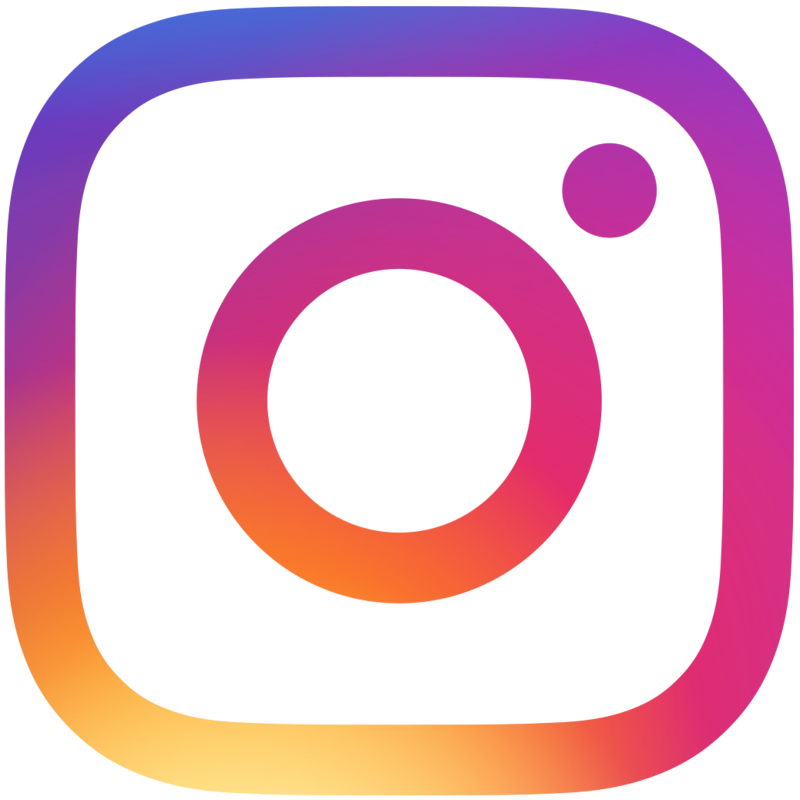 We’ve been to so many restaurants like Feller at the Lora—chic, flavor-of-the-month upscale eateries parked inside of boutique hotels—that we steeled ourselves for the possibility that we would be overcharged and underserved. Feller’s sleek interior and precious motto (“An exploration into modern-day hunting and gathering”) also sets up visions of sales and marketing rather than food and drink. But then: the food hit the table. 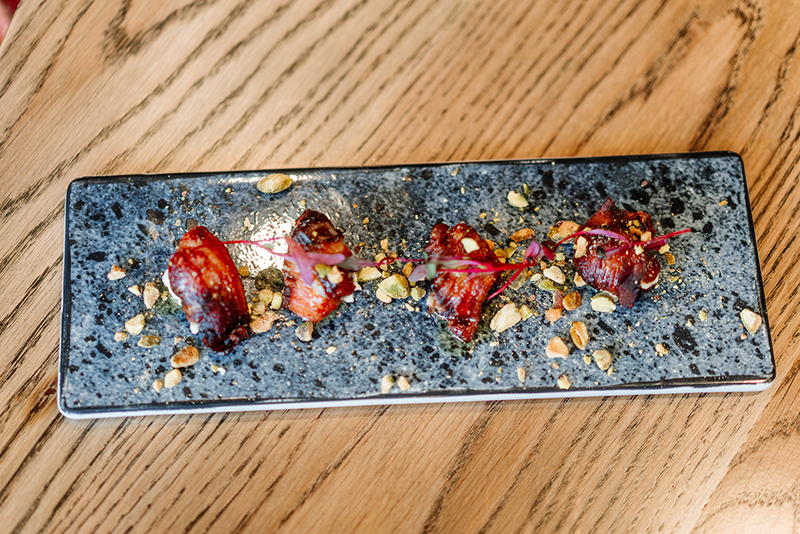 The Bacon Wrapped Dates ($10) at Feller were so good we featured them as a Bite of the Week; we won’t recap it at length, but suffice it to say that they’re a beautifully balanced update of a classic appetizer. 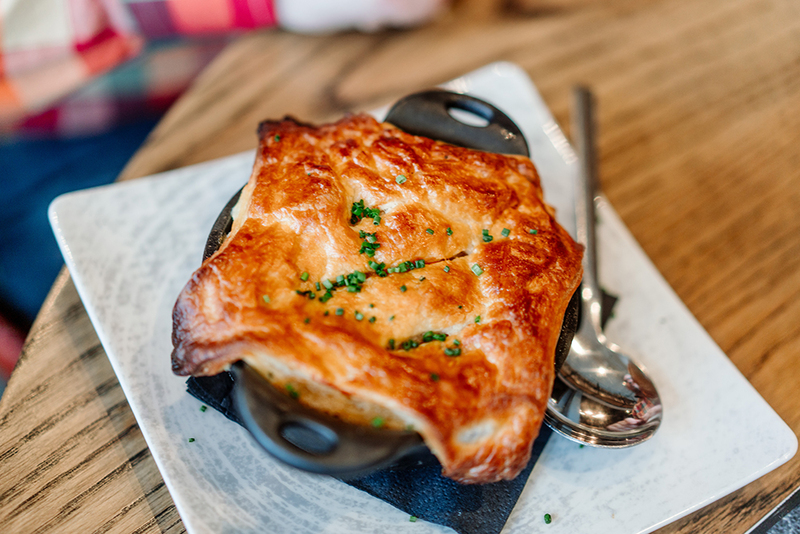 Our Cast Iron Pot Pie ($13) boasted a buttery, flaky top that sprawled across the pan. That ravishing piece of pastry concealed a piping hot filling that was rich and fully flavored, dominated by the mellow earthiness of the pie’s pheasant filling. The restaurant’s signature burger ($16) was a triumph, too—onion earthiness, meatiness, bun, and tangy kick from a house pickle were all in harmony as were the overall proportions of the dish. At $16, this burger had to really perform, and it did. The presence of delicate, shoestring fries was welcome, too. Should you ever find yourself in the Miami airport, seek out the La Carreta counter and get yourself a couple Cuban coffees and cubano sandwiches; they’re good enough to pass muster even outside of mass-transit surroundings. Stillwater’s La Carreta has no relationship to its Floridian cousin, but the food is also good enough to defy its setting. This humble, strip mall-based Mexican restaurant has its own salsa bar (always a good sign) and a menu featuring dishes and flavors angled at first-generation Mexican customers (ditto). Tacos at La Carreta, as you’d hope, come correct. The Barbacoa taco ($2.75) was deeply spiced, tender, and pleasurable to inhale in just a few joyous bites. And the Asada ($2.75) was beefy and nicely balanced between meat, onion, and cilantro. The salsa bar adds whatever additional notes of heat, depth, or herbal brightness might be desired. Even better were the Chicken Fajitas ($14). Fajita fillings can be under-seasoned and bland—La Carreta’s chicken was thoroughly and thoughtfully marinated, the vegetables still crisp but properly sauteed, the beans creamy, the rice perfectly cooked. This is one of the better versions of the dish we’ve tasted in the metro, and we’ve tasted many, many fajitas over the past decade or so. 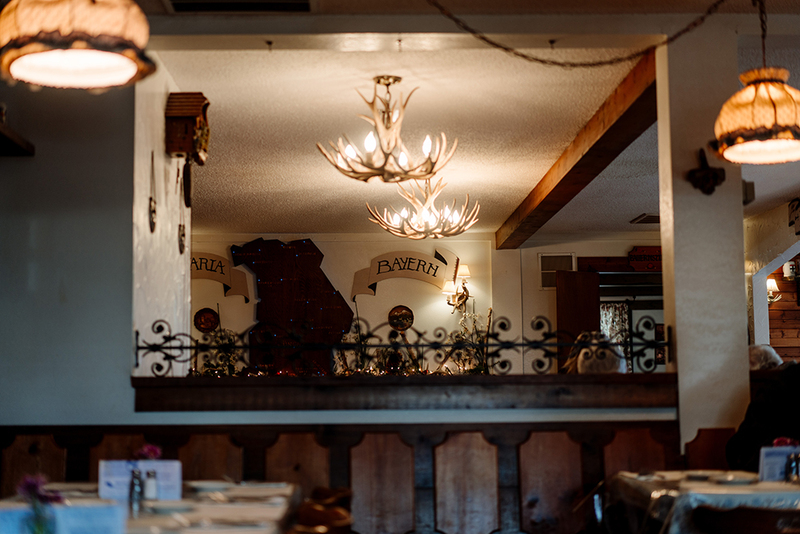 The Gasthaus serves an honest, lovingly rendered spin on German-American fare. Numerous little touches make even a casual lunch feel like an event, ranging from the bread basket (which includes a tasty rye roll) to the soup (a rich, pleasantly spiced curried chicken on the day of our visit) to the crisp, tangy red cabbage slaw that accompanied our Jagerschnitzel ($13). 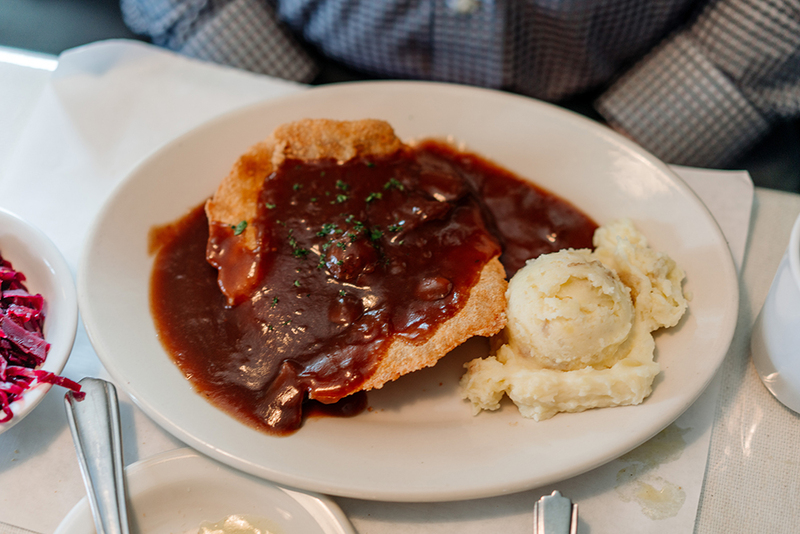 About that Jagerschnitzel—the heavy, wine reduction-based gravy that coats the crispy but somewhat resilient pork cutlet is a bit heavy, and the dish doesn’t make total sense… until you get that slaw into the mix. The bright, vinegar-kissed flavor of the cabbage works (along with its crunchy texture) to balance out the other elements of the schnitzel, making for a pleasant, well-rounded dish. Our Sausage Platter ($13) was less complex—the sausages that graced our plate were just tasty in a classic, uncomplicated way. The knackwurst was bright, bold, and balanced, and the weisswurst was tender and creamy with a kicky vinegar finish that focused the dish. And the sausage platter also sports some of the tastiest potatoes we’ve tried in quite some time, tender little squares dressed with a tangy vinaigrette that makes every bite a pleasant and compelling experience. Coming off of the high that was Feller at the Lora, we were ready for whatever came our way at MatchStick at the Hotel Crosby. Surprise! Yet another delicious meal, this time in a room eye-catchingly lined with backlit bottles of brown spirits. Although Matchstick Grill in theory extends into (and includes) the hotel lobby of the Crosby, you’d be hard-pressed to spot the check-in desk—the interior design is elegant, understated, and cozy with a side of class. 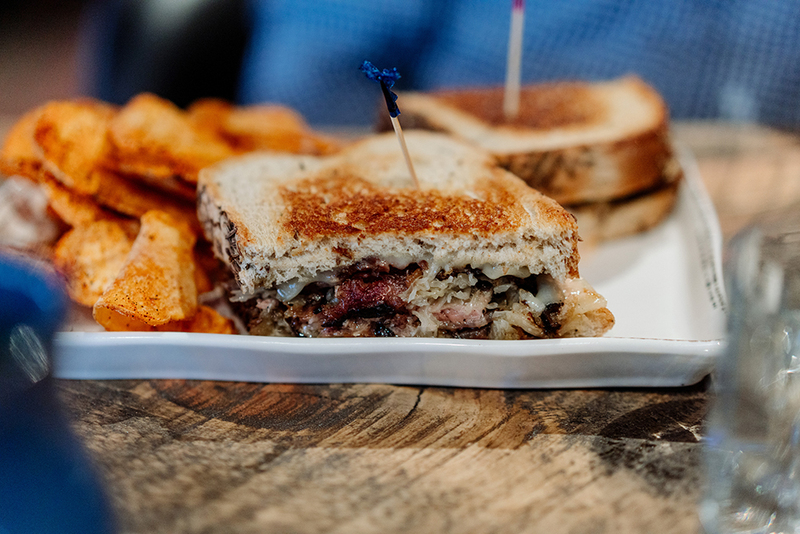 The MatchStick Smoked Brisket Reuben ($12) can’t really be edited—its meat is remarkably rich and tender, its kraut understated but supportive, its bread full of caraway punch without crushing the contents from either a texture or flavor perspective. 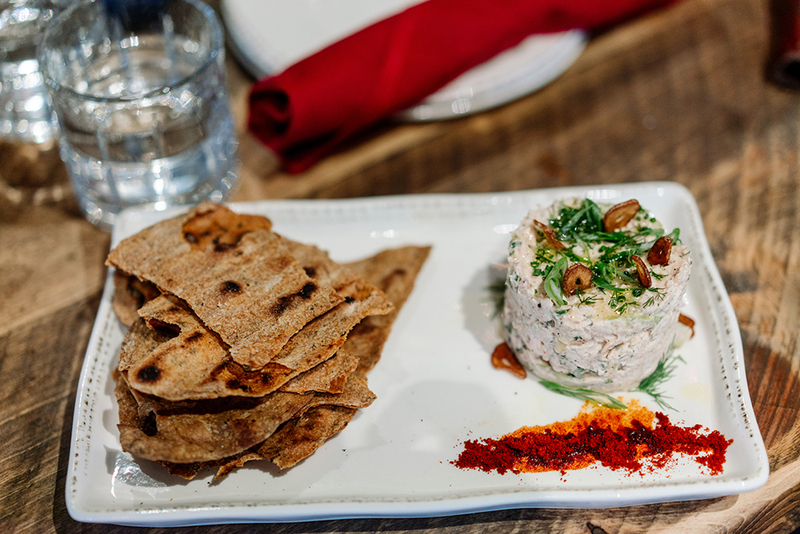 We dug our Smoked Trout Dip ($13), too—it was something like an upscale tuna salad, a balance of fresh veg, delicate lightly smoked fish, and crispy flatbread. We wouldn’t normally bother mentioning a stray cup of coffee ordered at a lunch like this, but MatchStick’s brew ($3) was smooth and full-bodied, an ideal complement to the winter weather. From atmosphere to interior design to culinary execution, Lolito deserves credit for consistency of vision. This is upscale Mexican-inspired tavern fare, elevated in terms of presentation without being precious or fusion-y. The bright, clean, cheerful dining room feels immediately welcoming, and the menu is tight and coherent without being dull or restrictive. We ordered cocktails on general principle (that principle being: “What if they’re great?”) and lo and behold, they were great. The Carlito ($8), in particular. This Thai basil shrub meets lime meets habanero tequila beverage was refreshing, balanced, and beautifully spicy—just hot enough to burn, but not so much to overwhelm the rest of the flavor. Our Lolito Margarita ($8) was a classic tequila plus lime situation with the addition of orange juice, which took some of the sharp edges off of the drink (for better or worse). We liked it but might have liked it more without the OJ. On the food front: the Tomatillo Guacamole ($6) ranks among the best restaurant guacamoles we’ve tried. Balanced in terms of flavor and texture, properly seasoned, light on its feet without feeling diluted or whipped, this went down frighteningly easily. 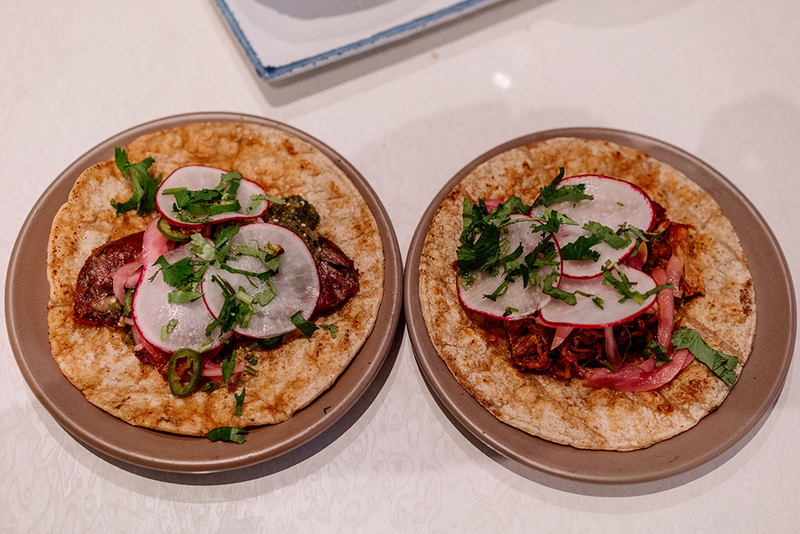 Both our tacos were good—our Pork Shoulder ($6) had an earthy solidity to it, with an onion kick and a real habanero burn. Duck Carnitas ($6) were full-flavored and rich with a push-and-pull between spicy and sweet. Our only minor dig would be the tortillas, which were pleasingly substantial but dry and chewy to the point of distraction. You don’t see many moquecas around here, so we felt obligated to try Lolito’s version ($9). 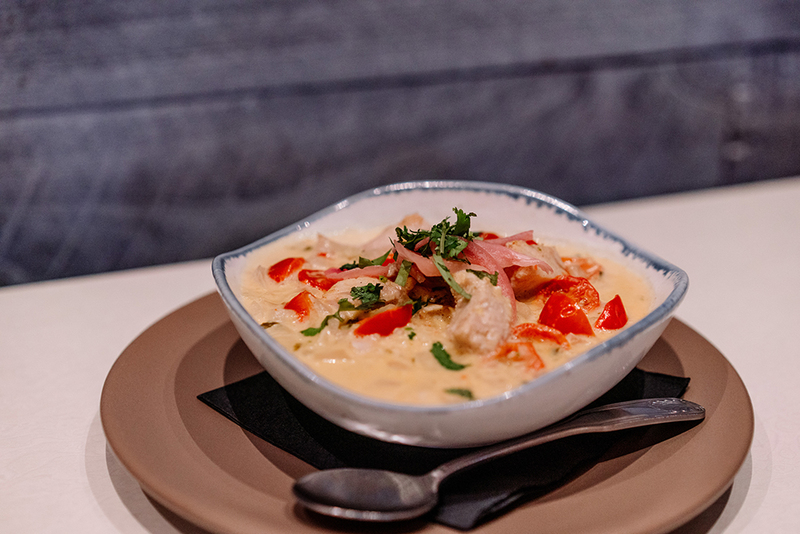 This lime / tomato / fish / coconut milk / rice curry hails from Brazil, but the flavors and textures wouldn’t feel out of place in a Thai or Malay restaurant. Compared to the moquecas we’ve had in the Brazilian / Portuguese parts of Cambridge, Massachusetts, Lolito’s version was mild and tame but still pleasing, with sliced cherry tomatoes providing pops of color and texture against a soothing backdrop. 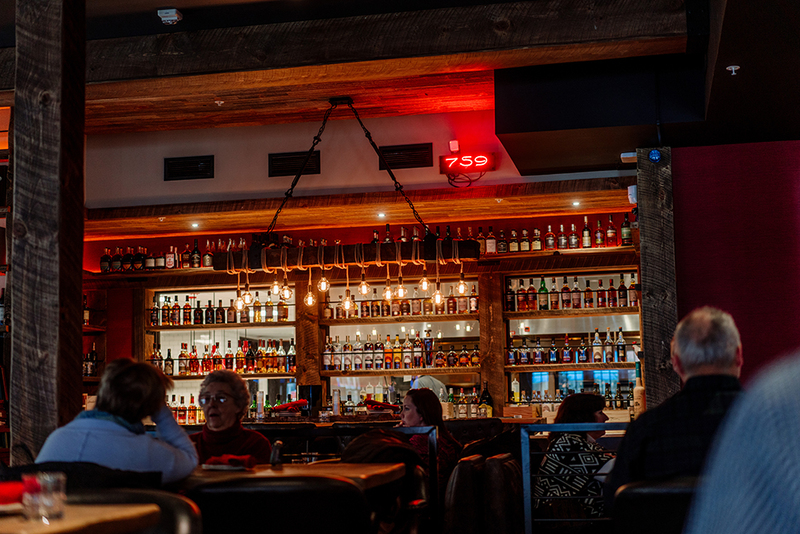 Those in the know will vouch for Domacin as being one of the best wine bars in the state—its list is sprawling but curated, and it’s clear that vino comes first at this cozy spot just off of Main Street. 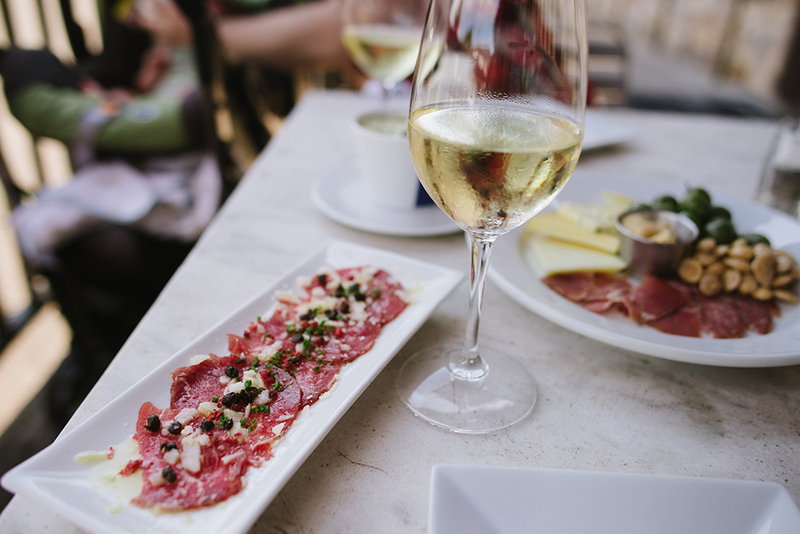 There are two main ways you can go when you dig into the Domacin menu for some food to accompany your wine: small bites (cured meat, fine cheese, assorted nuts) and fine dining. 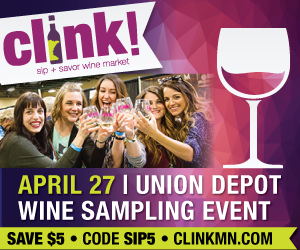 We’ve always done the former and enjoyed it—cheese and charcuterie fits the wine-sipping lifestyle pretty perfectly, particularly when the weather is warm and the patio is open. As for fine dining, we dipped into a couple of items with mixed results. The two Seared Scallops with apple habanero puree plus beet and fennel slaw were perfectly cooked (nicely seared exterior, extremely tender interior) but, at $17, they need to be. The Rabbit Pappardelle ($24) was too austere—the herb cream sauce should have been significantly richer and creamier to compensate for the earthy dryness of the rabbit, and while the noodles were pleasant enough, they didn’t hit the “I could literally just inhale this bowl of pasta” heights of supple texture that the price tag demands. 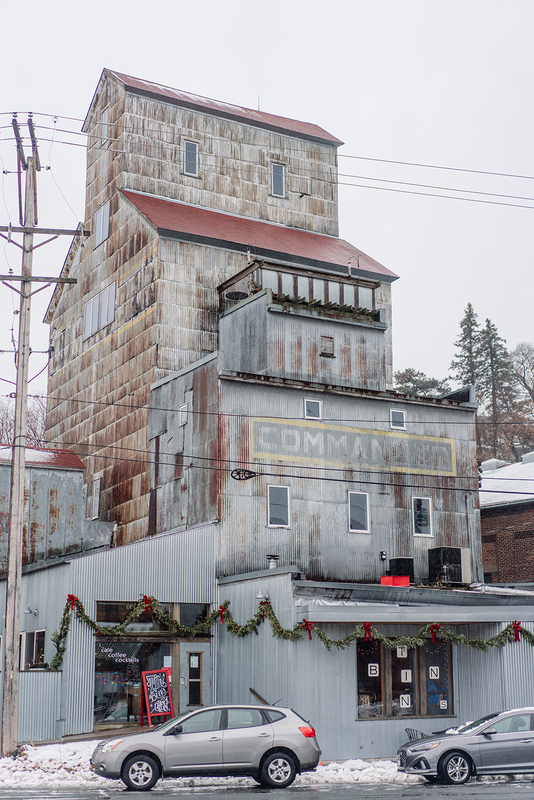 Located inside of the historic Commander Grain Elevator, Tin Bins is one of those spots that seamlessly integrates regional history and contemporary gastronomy—it’s a way to feel like you’re part of Stillwater’s commercial past while still staying current on your coffee culture. After a trip several years ago to New Zealand, we can’t resist ordering Flat Whites ($3.90 for a 12-ouncer at Tin Bins) whenever we see them. The Tin Bins version lacked the absurdly low acidity and almost creamy smoothness that we remember from Auckland, but it worked as a tasty latte, with just the right amount of bitter coffee bite and dairy richness. Our eggnog latte ($3.65 for 12 oz.) was better still, a pitch-perfect version of a drink that can often turn into a syrupy, sugary mess. The Tin Bins version was nutmeg-forward, with enough sweetness and dairy to support the spice in a balanced way. A bowl of the Chicken and Wild Rice soup of the day ($5.75) wasn’t quite so artful. The temperature was warm, not hot, and the texture closer to warm, jiggly Crisco than soup. Chicken bouillon dominated the flavor aspect of the soup, and the mushy, overcooked wild rice lacked the chewy pop this grain can achieve when cooked well. 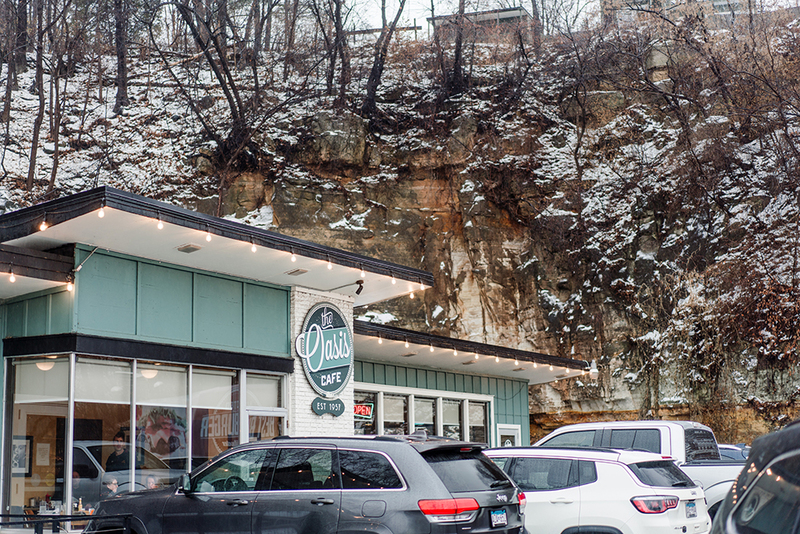 There are few breakfast options more iconic than Oasis Cafe, located in a charmingly weird smashed-up-against-a-cliff location just south of the city’s historic downtown. Open in one form or another for about 50 years, the spot is a Stillwater go-to for hearty, old-school American diner breakfasts. Despite undergoing several extensive renovations and expansions over the past few years, the food at Oasis Cafe seems to be a throwback to a simpler time—nothing we tried was broken, but neither was it particularly delicious. Our Colorado Haystack ($11.50) combined ham, green peppers, onions, cheddar cheese, and fried eggs served atop a pile of hash browns. The hash browns were crisp and tasty (if underseasoned), and none of the other elements really asserted themselves—this is a dish for potato lovers only. With additional salt and some hot sauce, the Colorado Haystack works as a breakfast entree but doesn’t dazzle. We gave the Candied Jalapeño Corn Bread ($11.50) a shot due to the dish’s intriguing composition—it’s cornbread topped with chili con carne and basted eggs. The cornbread was sugar sweet, the chili nicely spicy but under-seasoned overall, and the eggs competently cooked. For diners focused on quantity and classic options, Oasis Cafe can’t be beat—but for a newer-school experience, the Chilkoot Cafe (see below) has a lot to offer. There is—or at least should be—a spot in all of our lives for a reliable, no-frills Thai restaurant. Perhaps the depth of spice doesn’t measure up to On’s, or the noodles aren’t as perfectly tacky and drenched with flavor as they are at Thai Cafe. That’s all right—sometimes it’s a question of surviving a weekday, not having a peak culinary experience. Stillwater’s Thai Basil is just that sort of reliable stopping place—a straightforward menu, warm service, and reliable food are its selling points. We grabbed an order of the chicken Pra Ram Rong Song ($9) for lunch and found this peanut and coconut milk entree to be just what we’d hoped it would be: a rich, soothing, mildly spicy sauce riding atop fresh-tasting steamed spinach, broccoli, and carrots. With bright, properly cooked veg working to balance the fullness of the sauce, this dish really works. Our appetizer portion of fried tofu ($4.29) was pleasant enough but weirdly massive: each of the five fried tofu triangles in our order was roughly six times the bite-sized portion we’re used to eating at other Thai restaurants. No complaints—the tender interior and crispy exterior made for an enjoyable contrast, and the whole thing was tasty when dipped into the accompanying sweet sauce or, for that matter, the extra sauce from our Pro Ram Rong Song. During our breakfast-time visit to Chilkoot Cafe and Cyclery, the place had the feel of a more morning- and athletics-focused Cheers: everybody seemed to know everybody else, and the mood was casual in a warm, lived-in kind of way. 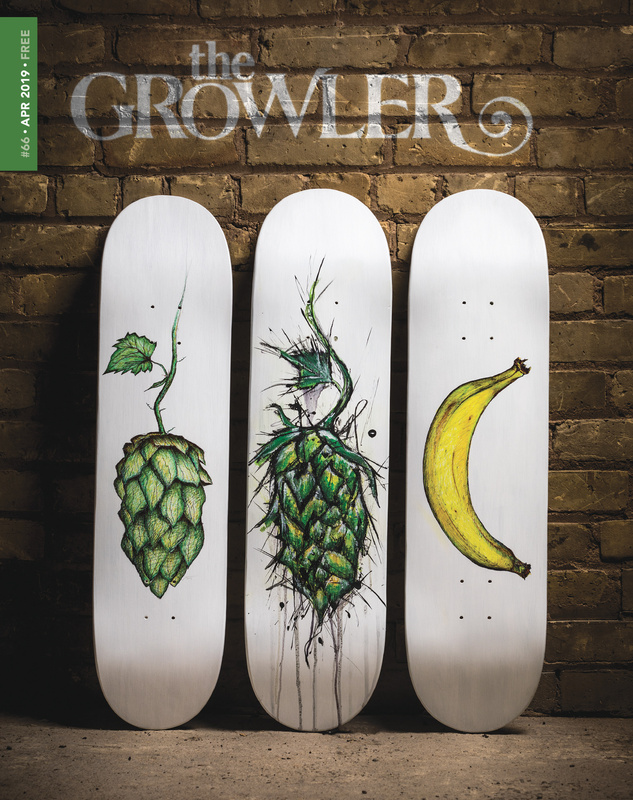 It makes sense that the place has such a laid-back vibe, as Chilkoot is a jack-of-all-trades—it offers breakfast, lunch, dinner, coffee, craft beer, and bicycles, meaning that any attempt at pretense would soon collapse under the sheer weight of hours and the variety of duties that employees have to fulfill. 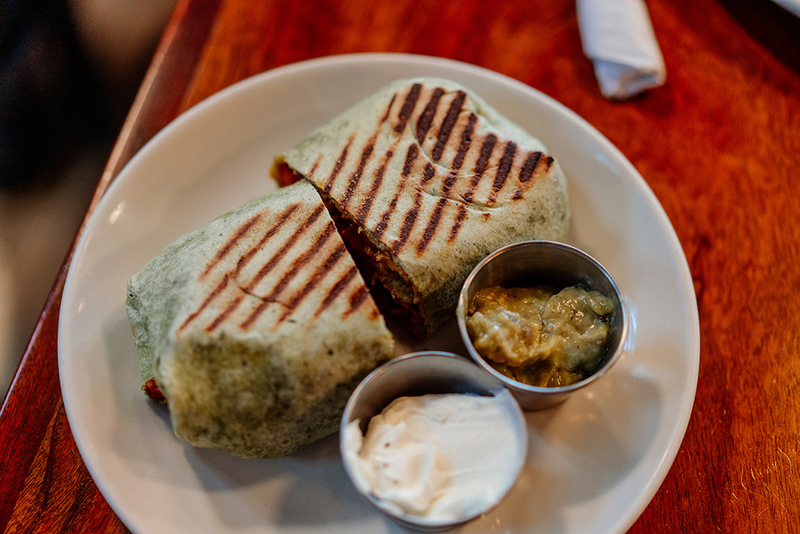 The cafe’s Biker Burrito ($9) is a triumph in a tortilla—a well-balanced mix of tender, perfectly cooked scrambled eggs, ancho peppers, bacon, onions, cheddar, potatoes, and sour cream. Burritos so often go wrong when things get stale, overly crunchy, rubbery, or mixed in badly conceived proportions, but this breakfast buddy is balanced and beautiful. Although it might not seem like much, the cafe’s Cherry Danish ($3.25) was a lovely way to round out a cup of coffee—it was buttery, tender, and sour cream-forward in a tangy, bright manner that moved it past the usual “creamy sugar bomb” category that tends to define these things. The cafe’s Brioche French Toast ($10) is a bit of a twist on the typical presentation—the slices are thin and lack the custard-like center that so often defines this dish. But perfect crispy browning on the bread makes this simple entree a pleasing breakfast powerhouse. Honeyed ricotta gave it a bit of tang and additional sweetness without overwhelming the balance of the dish.